Cm7 stands for C-minor seventh (or seven, if you like). It is more akin to C7 (C-major with a seventh note) than it is to Cmaj7 (C-major with a major-seventh note). 1. Keep your index finger bar from the A string to the high E string, behind the 3rd fret. 2. Keep your middle finger on the B string, behind the 4th fret. 3. 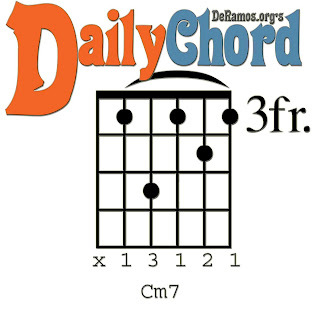 Keep your ring finger on the D string, behind the 5th fret. 4. Lift your pinky finger OFF the G string, 5th fret - the G string is now fretted behind the 3rd fret (by your index finger). 5. Avoiding the low E string, strum the Cm7 chord.